My Kind Of Introduction: It's Caturday...on Sunday!! When I was a kid, I remember always having a cat. My mama has always been a cat person and it wasn't odd for us to have 6 or 7 cats at one time! We never had more than 2 at a time inside, that's a plus! I loved every cat we owned and even had my a cat named Pooh Bear but he ran away... As an adult, I never wanted inside animals, I don't like the fur everywhere among many other things that bothers me abut inside pets. But in 2010, our neighbors had 2 female cats who were getting ready to pop! The first litter was ready just days before Jade's birthday and even though Alan was at work... we ended up owning a kitten because the girls insisted on being one home. My fiance was okay with it though because we were talking about getting the girls a pet anyways. 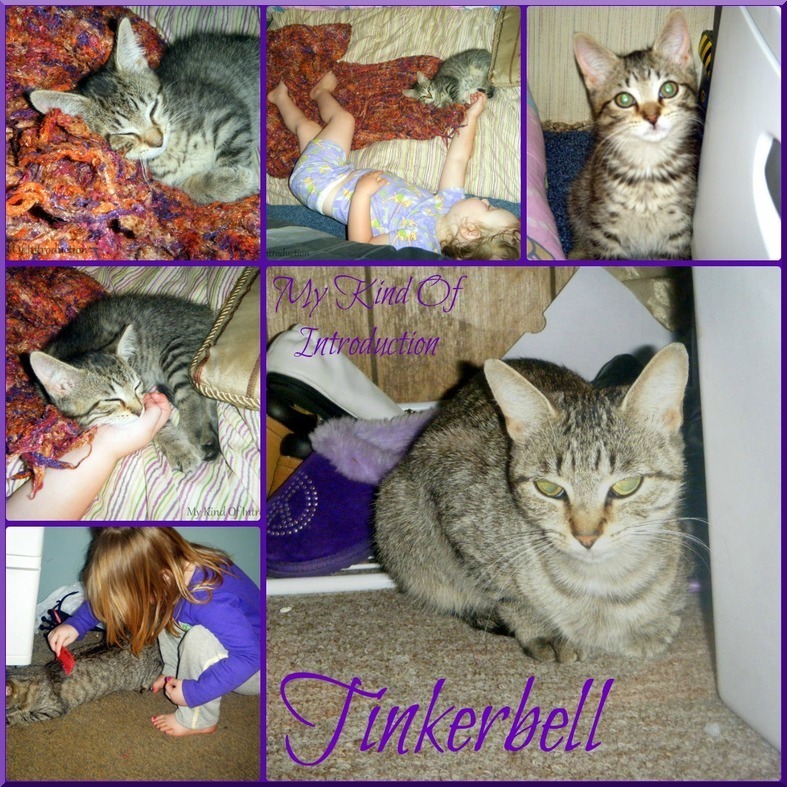 Since Jade's birthday was coming up, we let her name the kitten.... She named her Tinkerbell but often called her Tinkers. (She was really into Tinkerbell the faerie during that time) TInkers was so tiny and got stuck in a tree before she even made it in the house for the first time! It was great! A couple weeks later the other litter was ready to find new homes. You guessed it... Another kitten moved into my house. Just as Tinkerbell was getting use to her new home, she gets a tiny roommate! Loran's birthday was creeping near so she chose the name for our new kitten. That tiny little orange kitten got named Punkin Pie... Not Pumpkin - She got called Punkin often. Both kittens were girls. We loved those cats and they even moved a couple times with us. My daughters could do anything with those cats and they would just let 'em! We kept them for a couple years but ended up not being able to keep them. 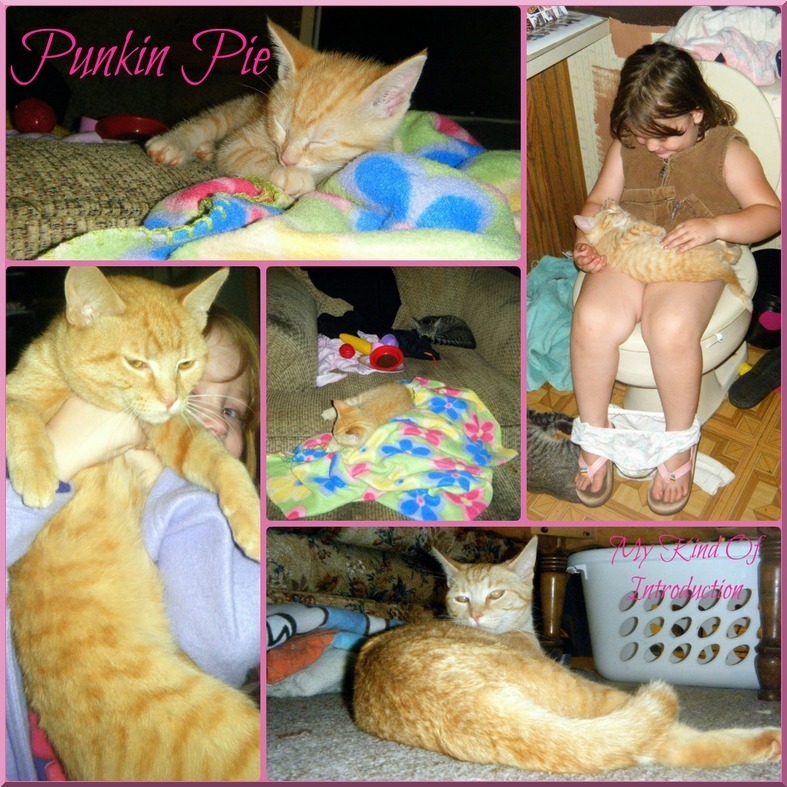 Tinkerbell got pregnant and we let her stay with a friend until she had her babies and we never seen her again :( Punkin got let out at my daddy-paws shop and he took care of her there until he believes a lady who lives near by may have took her inside, which is good since Punkin Pie was an inside/outside cat, but spent 80% of her time inside. It's been 3 years and we still think about our cats sometimes. The girls remember them well and I've had to promise to get them another pet again soon. I leave my door open to much during the summer to get a cat and I don't like dogs in my home more than I don't like cats inside! So I'm not sure what kind of pet we'll get but I'm sure I'll find out sooner or later. Do you have a pet that's become a part of the family? Or are you missing your four legged friend? If you like cats - Check out this Artwork from an Artist who uses Kittens to Recreate Classic Album Covers! Don't forget to hop over to the feline blog hop also! It's Caturday every day if you ask me! I am sorry you lost your kitties - I couldn't be without mine! They are indoor kitties really but I do let them out into the garden in the summer. They are such dopey things that escaping doesn't tend to occur to them.